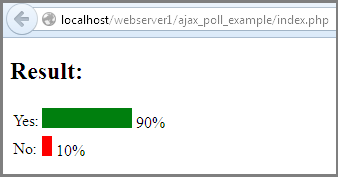 In this tutorial, we'll be creating an Ajax Poll Script that displays the results with colored images using PHP and Ajax. This is a very simple Ajax poll script. Poll results will be displayed on the current page without moving to another page. The result of the poll is stored in a separate text file and results will be displayed based on the values stored in this file.As the data is saved in flat file it does not require any database. Below are the snapshots of the script output.